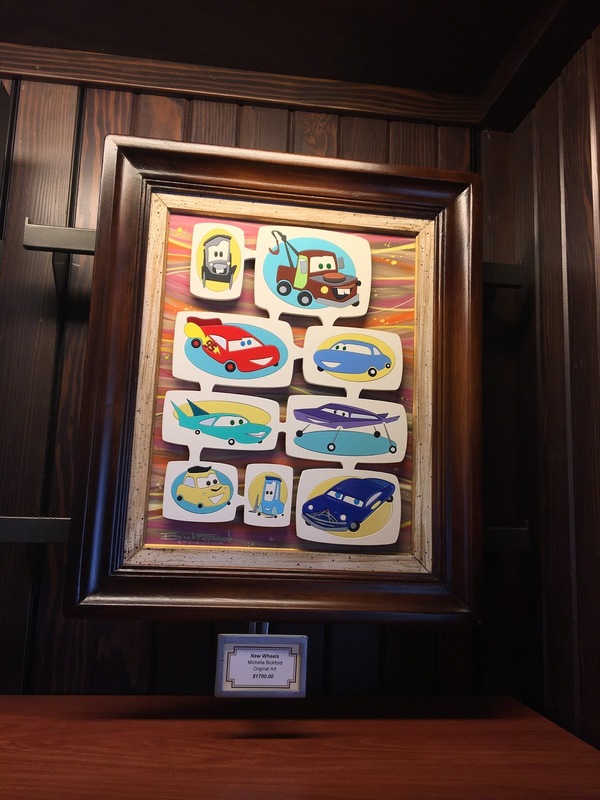 While my wife and I were visiting Cars Land at Disney's California Adventure last month, I stumbled upon some very cool Cars art that I couldn't pass up. I was especially happy to see that all of the pieces I was interested in were available in an affordable, space-saving 5X7" postcard size. For today's post, I'm showing off one of the designs I purchased—namely, "New Wheels" by artist Michelle Bickford! Many of your favorite townies from Radiator Springs are here including: Stanley, Mater, Lightning McQueen, Sally, Flo, Ramone, Luigi, Guido and Doc Hudson. This is a real standout. Bickford pulled off something truly unique here and it really caught my eye. I've never really seen anything quite like her style, so at first I admittedly thought it was a little odd. 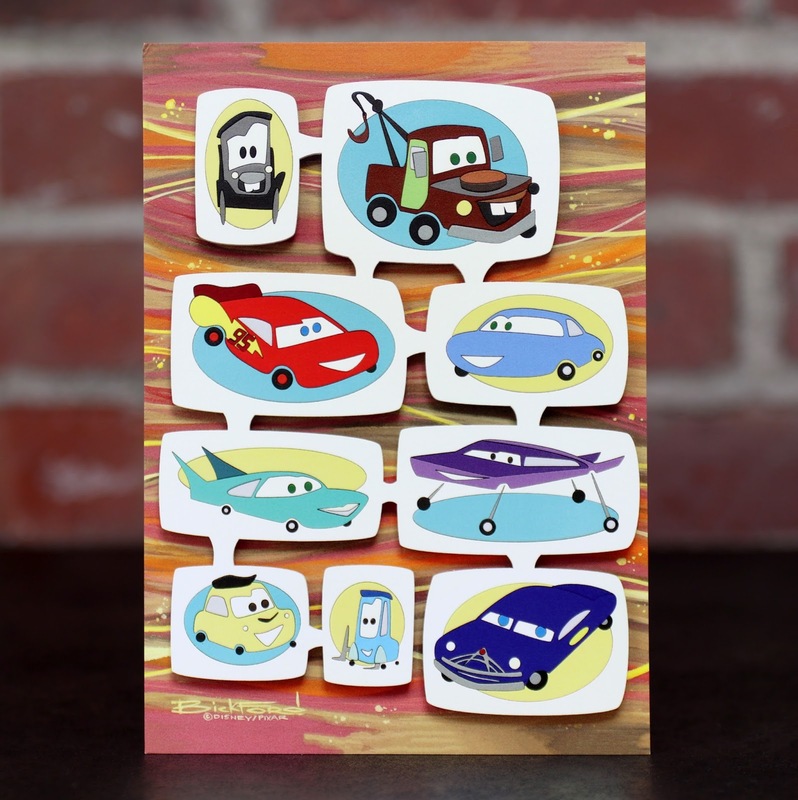 She went incredibly minimal and stylized here with the Radiator Springs characters, all featured in connected bubbles. The more I looked at it though, the more I appreciated it's simplistic boldness, colors and overall wacky (yet so lovable) look. It wasn't long before I was thinking "OK this is really cool. I wonder what else this artist has to offer?". What really sold me on the design was seeing this fun 3D version of the print [below] all framed up on display at Ramone's House of Body Art. Is that not cool or what? There was no way on earth I could ever spend $1700 on it, but man I would have if I had all the funds I could possibly want. I definitely get a retro 50s/60s vibe when looking at her designs of these characters (with a touch of funky modernism). The blobby shapes, straight lines, curved edges and use of triangles (not to mention the abstract-esque background) are all very much aspects of classic mid-century-modern art (which is hard to describe, but I know it when I see it); and having checked out more of Bickford's art since, the interconnected "speech bubble" type shapes seem to be a signature design element of hers that she incorporates in most of her art. If you dig this print as much as I do, be sure to pop into Ramone's House of Body Art next time you visit Cars land. 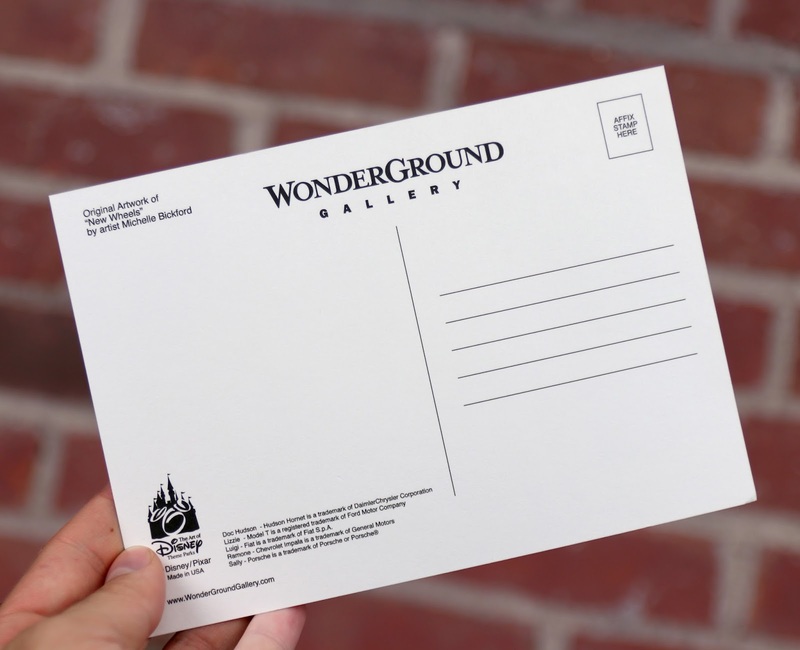 Retail is only $4.99 for this postcard size. Let me know your thoughts on this piece in the comments below! To learn more about Michelle Bickford and to view more of her art, check out her website HERE or her Facebook page HERE.